The DSLR-A350 features Sony's 'Super SteadyShot' sensor-shift image stabilization system (a development of the 'Anti-Shake' system we first saw on the Konica Minolta 7D). This system works by moving the sensor in the opposite direction to the sensed shake movement of the camera. This test is designed to produce a determination of the relative improvement you should expect using the SteadyShot system compared to with it switched off. Twenty hand-held shots are taken of a static scene at reasonable shutter speed (1/80 sec in this case), ten without stabilization, ten with. The shutter speed is then decreased by a a third of a stop and twenty more shots taken, this is repeated down to 1/4 sec. The test chart was approximately 1.2 m away from the camera. The resulting images were then inspected and given a blur score from zero to three where zero represented a very blurred image and three a sharp image with no noticeable blur (see crop examples below). Obviously the amount of blur which is acceptable will depend on your personal taste and the final image size (for instance a '2: Soft' will still look fine as a 4x6 print or in a web gallery). 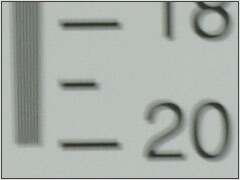 Example crops from these four blur scores can be seen below. Here we only include the results near the point that shaking starts to impact image quality. Without Super SteadyShot, we were see 100% sharp images down as far as 1/50th of a second. Below that, the 'keeper' rate drops off progressively. With 'Super SteadyShot' switched on you can see an immediate improvement. All the shots taken at 1/20th of a second are sharp and it's not unto 1/5th of a second that we get fewer than 70% of the shots sharp enough to be unusable. That's around 1.6 stops better.